New color! Kiwi. Just for Spring. 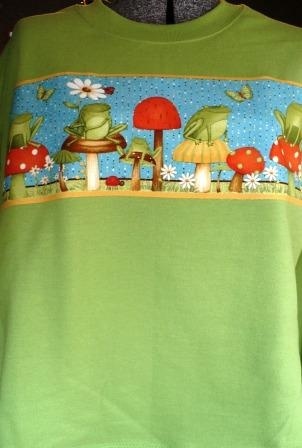 I found this really cute frog and mushroom fabric that goes great with this new sweatshirt. You can order either with or without the elasticized band on the bottom. Most people go down a size if they want the band off. If you want this made up in a different color, put a note here.